The different landing operations, in Dieppe, in Sicily and in Normandy, required that new types of ships be built, especially designed for carrying troops and material in preparation for an amphibious assault. 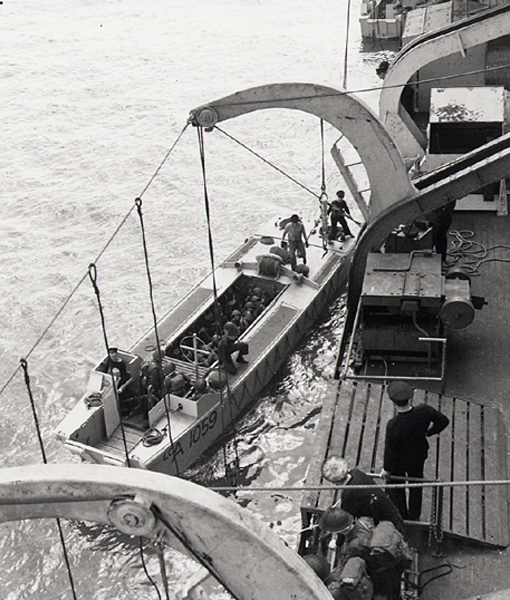 LCA 1050 leaving side of HMCS Prince David, loaded with soldiers of the Régiment de la Chaudière, 9 May 1944. Photo by R.G. Arless. 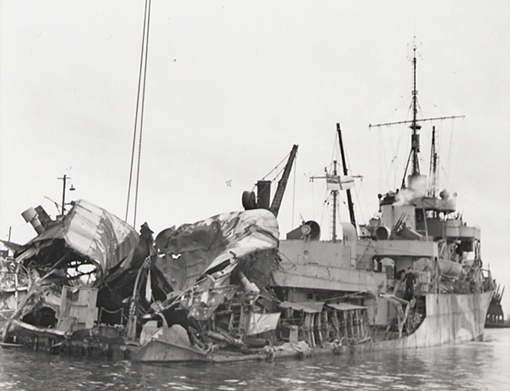 Department of National Defence / National Archives of Canada, PA-141525. The Royal Canadian Navy (RCN) bought two pre-war steamers from Canadian National Steamships, which were converted for transporting troops: HMCS Prince David and Prince Henry. They could carry 550 infantrymen, as well as six LCAs and two LCMs. Their role was to get within a few kilometres from the landing beach and to launch the LCAs and LCMs tied to the davits. The LCAs and LCMs act as shuttles between the ships and the beach until all men are landed. On June 6, 1944, D-Day, Prince David and Prince Henry were used for landing British troops on Gold Beach. LCAs are small wooden boats, 12.5 m in length, equipped with machine-guns. They can take up to 30 men to the beach, having to progress under enemy fire as long as the beaches were not under control. LCMs have a 15.2 m-long steel hull, with a landing ramp at the bow. They can carry vehicles as well as men, and when they reach the beach, the ramp is lowered to let them out. LCMs are equipped with machine-guns. LCI(L) 299 of the 2nd Canadian Flotilla carrying personnel of the 9th Canadian Infantry Brigade to the Normandy beaches on D-Day. Photo by Gilbert A. Milne. Department of National Defence / National Archives of Canada, PA-136986. Designed in Britain, LCTs can take six tanks on board; they come in several types depending on the vehicles they carry or on their armament. Some have a special ramp for launching amphibious tanks (Duplex Drive or DD tanks) at sea. Others can fire rockets against enemy positions and ensure the protection of the landing troops. LCT(SP) can also carry self-propelled guns that are positioned at some distance from the beach and cover the assault troops. An LCI is designed for a long crossing with 150 infantrymen on board in addition to her regular crew. Built in the US, LCIs are 48 m-long and can reach a speed of 12 knots. Crossing the whole width of the Channel, in contrast to LCAs and LCMs, LCIs reach the beach only after the first assault has been made. These are the ships most usually seen on D-Day photos, with their two lateral ramps that let soldiers down towards the beach. On June 6, 1944, the RCN had ten flotillas with three LCIs in each. They landed 4,600 men on the Normandy beaches.